Place the flour in a bowl and beat well with the egg and cottage cheese. Finely chop the ham, tomato and mushrooms, and stir through the mixture with a good pinch of sea salt and black pepper. Put a large non-stick frying pan on a medium-low heat. Once hot, put heaped spoonfuls of the mixture into the pan to give you six popovers. Leave them to get nicely golden for a few minutes, then flip over and gently flatten to 1cm thick with a palette knife. Once golden on both sides, remove the popovers from the pan for a moment, then turn the heat off. Finely grate the Parmesan into the pan to melt. Place the popovers on top, wait for the Parmesan to sizzle and go golden from the residual heat of the pan, then use your palette knife to gently push the cheese towards each popover. 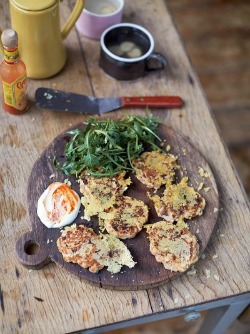 Once the crispy popovers can be easily prised away from the pan with your palette knife, bang them out on to a board.